The world is a different place today. Pre-2014, social media users, who were politically aware, had seen the twitter feeds of their top anchors, or more recently, had referred to fact-checks by sites like OpIndia.com, to realise that many of their favourite TV anchors and TV channels were not as “neutral” as they claimed to be. Today, almost everyone knows where an NDTV stands and also where channels like Times Now and a Republic stand. Similarly, most of us know the political inclinations and biases of the likes of Rajdeep or Arnab. Although there are plenty of new media ventures which still fly below the radar, it is largely clear which section of legacy media leans on which side. This, is akin to the model followed in the United States, where the consumer knows exactly what political stand which media house has taken or perhaps would take in any given situation. This disclosure helps a consumer in appropriately consuming news, discounting biases which he or she may encounter. The media too is not being dishonest about its neutrality. What you see, is what you get. While the Indian media scene has cleared up, in the run up to 2019, we will encounter a new beast. Around 5 years ago, stand-up comedy was a nascent industry with a handful of big guns. Today stand up comics are found by the dozen. Back then, most comics would swear by their political neutrality or apathy. Today, the masks are off, but only for a few. Take the example of a comedy group called East India Comedy. They had brought out a song on demonetisation, which took various potshots at BJP, Modi and the scheme. I have to admit it was moderately funny, and some may have really enjoyed it. And it’s clearly within their right to freedom of expression. The same group more recently wrote a song on “Aadhaar”. Aadhaar is definitely fair game and there can be numerous issues relating to it, which can be criticised. But one look at the video, and you know where they are heading. While half the song sticks to Aadhaar and makes some valid points, they soon morph into an anti-Government rant. “Anti-national” comment is mocked, a line actually goes as “Vikas ke naam pe topi”, Demonetisation and GST are ridiculed, and the piece de resistance: “acche din are only for Amit Shah’s beta”. I am not sure how any of these issues are linked to Aadhaar and why they appear in a song which they claim is on Aadhaar. I am not even going into factually rebutting their claims because “hey it’s a joke”. The issue here is not that they are criticizing the Government. The issue here is, they claim to be “neutral”. While they claim to be doing a song on Aadhaar, one ends up listening to a song which could very well have been written by Congress’s social media team. This line will be offensive to most stand-up comics although they would not skip a heart beat while labeling any pro-Government individual as “bhakt” or “paid” or “BJP IT cell”. This besides using a string of abuses for anyone connected remotely to the BJP. Another example is stand-up comic Kunal Kamra, who has now begun conducting interviews with Jignesh Mevani, the uncouth Congress backed MLA from Gujarat who has been charged by Maharashtra police. Kamra also extols his fans to donate to leftist propaganda website The Wire, which lies habitually, and states : “No more sitting on the fence”. To reiterate, comedians, like anyone else, have the right to be politically active, support a cause and oppose anyone they choose. The central issue here is : Are they really open about their inclinations? Will the average viewer coming to their shows or watching their videos, know that they are supporting a particular party, and thus, their skits or jokes maybe biased towards one side? Worse, have these comics become wittingly or unwittingly, tools for propaganda? For example, just a few months back, AIB had posted a “comedy” video which featured maliciously edited footage of PM Modi, showing him in terrible light. Once social media users pointed out the inaccuracy, the group deleted the video. What of the occasions when not enough people realize that they are being fed lies in the guise of jokes? 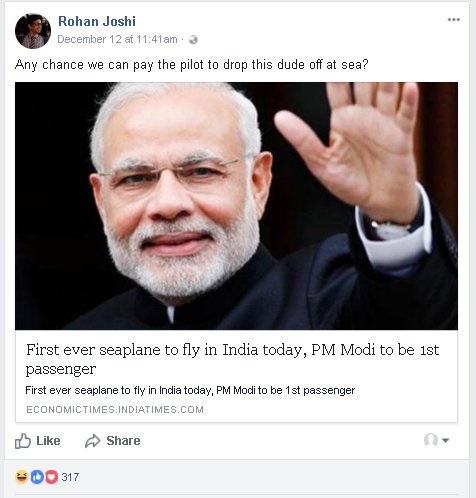 Rohan Joshi of AIB, had posted the same edited clip on his Facebook page, and has not deleted it, even after various people had commented that he was spreading an edited video. This is not how comedians operate, these are the actions of desperate politicians. Will Kamra entertain and embrace similar claims and abuses by others, or will he then ask Twitter to suspend the “troll”? Again, the point here is not to ask these people to refrain from making “jokes” on the ruling dispensation or Modi or BJP. Please do, but at least be honest about it. To paraphrase Rohan Joshi himself, I have more respect for comedians who openly declare that they want Modi dead and at least losing in 2019, rather than those who play the “we are oh so neutral objective comedians just cracking a few anti-establishment jokes” card. You’re all tools of propaganda. Hopefully, Rohan Joshi can not only pay heed to his own words, but impart such wisdom to his comrades as well. People from Agartala were furious with the blogpost by Vishal Dayama, senior writer at AIB, where he made some pretty insulting remarks about the city and its people.